Après means "after" in terms of time or a sequence of events. It can be used with expressions of time, nouns, and stressed pronouns. 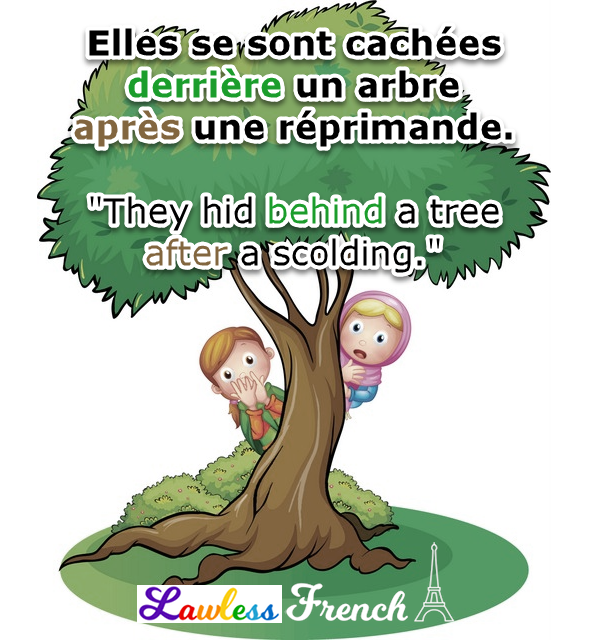 Après can also be used with several verb tenses. To talk about something that happens habitually. Je mange après que tu pars. I eat after you leave. Elle lave la voiture après qu’il pleut. She washes the car after it rains. When talking about something that will happen in the future, French requires the future or future perfect, even though the English equivalent is the present tense. Après que does not take the subjunctive. Derrière means "behind" and indicates a position or location, whether literal or figurative. It’s used only with nouns and stressed pronouns. Je veux m’asseoir derrière toi. I want to sit behind you. Courage, je suis derrière toi ! Take heart, I’m behind you!